Amusement park rides are a great example of and motivation for kinematic relationships. Here, a Ferris wheel provides an example of rotation about a fixed axis (RAFA). It is quickly shown for a rigid body that any two points on that rigid body can be joined by a “RAFA” stick. Using the RAFA stick, the following equations are developed. 25 minutes Any size stick, pinned on one end, and clamped to a desk. Ferris Wheel 1 $20-50; 45-60 minutes for KNEX Any toy model will work, as well as the KNEX version used in this example. Before Class: RAFA stick construction is a board bolted to a wooden base shaped like the textbook illustration representative of a pinned support. 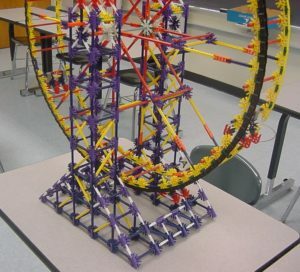 The KNEX Ferris wheel takes a little more effort, but also serves as a great display in the hallway or classroom. A few blow-up photos are included below. 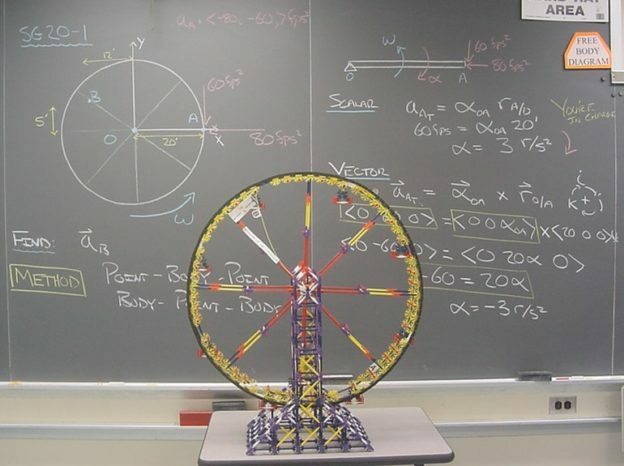 In Class: The Ferris wheel is quickly introduced as the motivation for the material and the RAFA stick is then utilized to develop the theoretical equations. The RAFA stick is also nice because it is very easy to demonstrate and “see” the difference between point and body properties, ie. – how the angle any part of the stick moves through is the same, but the distance traveled by your hand as it is placed further from the base increases. 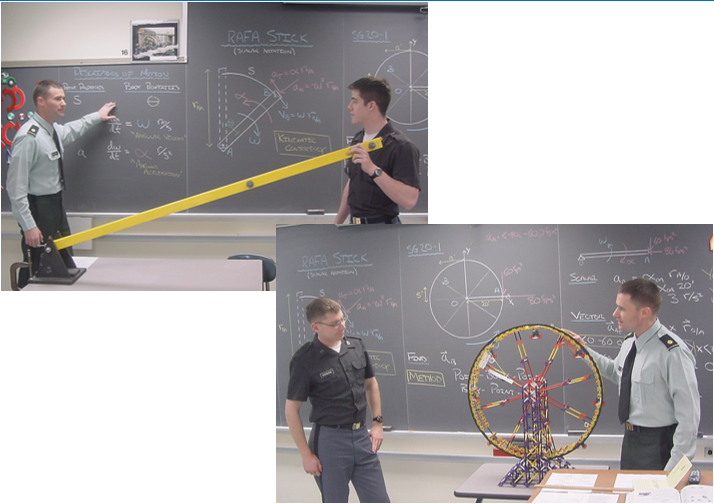 The Ferris wheel then is utilized to complete the lesson with an example problem by examining the velocity and acceleration of two different points on the wheel. Data is provided for one point and the information desired is about a different point. Tom Messervey (2017), "The Ferris Wheel," https://www.handsonmechanics.org/dynamics/314.